Tonight we celebrate Hollywood’s best and whitest, sorry… brightest. There is no Academy Award for Best Title Design. Why is that, you ask? How can an artform that has been so integral to cinema for so long be overlooked on Hollywood’s biggest night? Art of the Title has explored that particular issue in great detail in the past, devoting an entire feature to "The Oscar Question." The answer, as you might have guessed, is complicated, with every successive awards season serving as yet another disappointing reminder that title designers and title design have yet to get their due from the Academy of Motion Picture Arts and Sciences. Now that’s not to say that title designers, motion designers and graphic designers haven’t been integral to the Oscars over the years; on the contrary, designers and design studios have been demonstrating their craft at the Academy Awards for decades. Title cards, lower thirds, animated graphics, you name it. When type and motion meet on screen, a designer is never far behind – there are no names in lights without them. This year, the Oscars’ 87th, it was title designer Henry Hobson (The Last of Us) and studio Elastic (Game of Thrones, True Detective) who represented. Responsible for the nomination package and on-stage screen design, the team showcased all the tools in the title designer's arsenal for the stars in attendance and millions watching at home: typography, animation, photography, illustration, visual effects, sound, music and more. 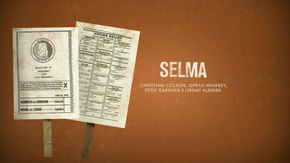 Employing a wide array of styles, from Saul Bass-inspired animated lines to Wes Anderson-esque overhead shot fetishism, Hobson and Elastic effectively captured the essence of each category and every nominee, impressing but never once stealing the show. 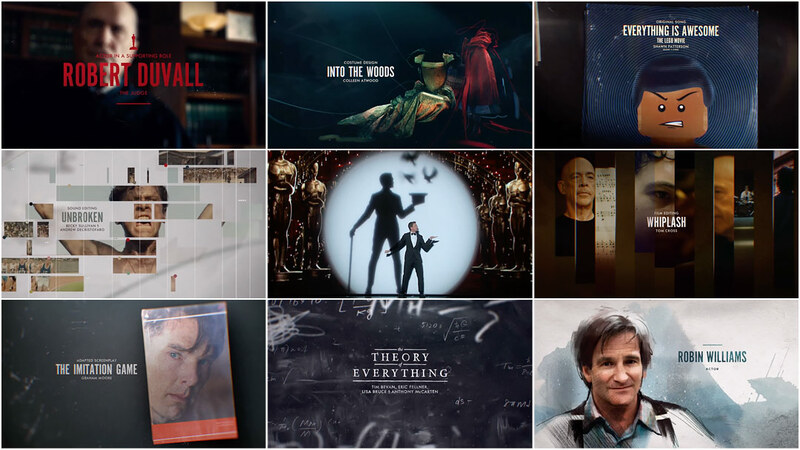 There may not be a title sequence category at the Oscars – and there might never be – but title design left its mark on the 87th Academy Awards, that much is certain. A discussion with HENRY HOBSON, creative director for the 87th Academy Awards nomination package design, broadcast graphics, and stage screen design. Henry, what have you been up to since we spoke about The Last of Us? It’s been a busy year. A few more titles - Killzone: Shadow Fall, Hysteria with Elastic - a few big commercials, including one for the video game Evolve, and post-production on my first feature film, Maggie, starring Arnold Schwarzenegger. 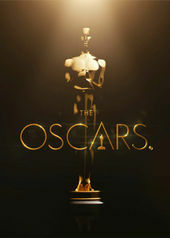 Could you talk a little bit about your involvement with the Academy Awards in previous years? My personal involvement has evolved over seven years, from lower thirds and category cards, to a more universal design approach. A few years back, some categories had some illustrated looks, and it became clear that you could involve more design in the whole project, and that the nomination packages could be a series of showcases of the art of design and the art of film production. How did Elastic become involved? Lee Lodge – the producer who runs the creative look of the MTV VMAs and Movie Awards, the CMAs, the Oscars, and One Direction's tour – was the co-producer of the show and creative driving force. He curates the teams and he was obsessed by the True Detective sequence. When I mentioned that Angus Wall was also at the same company, I’m sure it was an easy decision with the high level of creative talent on hand at Elastic. The team was myself and three designers, two illustrators and around twelve animators, who had to juggle between 23 different looks and styles in three weeks – from nomination announcement to delivery. Carol Collins and Jennifer Sofio Hall, as producer and executive producer, respectively, made sure we could build the project in the way we wanted and also had the near impossible task of wrangling the incredibly diverse set of sequences from the designs. Designers Leanne Dare, Paul Kim and Krystal Sojourner, with Yi Jen Liu and Song Kim, produced illustrated elements for ‘In Memoriam,’ Alan Chen, Peter Murphy, Sam Sparks, Michael Relth, Tony Kandalaft, Cameron Walser, Ryan Delk and Steven Do animated and edited everything. That seems like a pretty huge workload given the quick turnaround between the nomination announcement and Oscar night. Did you and your team get any sleep? I went in this year and said, “Last year we managed to do the whole show with only one weekend worked outside of normal hours.” I said, “This is our goal,” but it was immediately clear that I was being rabidly optimistic. The scale of work was far in excess of the previous years with the high level of animation and huge volume of work that we needed every minute of every day. The team was outstanding, tackling a mountain with gusto, and without the producers at Elastic, Carol, Kyle McIntyre and Jenn, we would never have made it. What was the development process like for all the categories you had to cover? I showed last year’s 9 categories and talked through the process, from receiving the nominations, to how fast delivery is and how we needed to emphasize the differences between each category, but also highlight the core of each. So Cinematography was set to echo the look through the viewfinder, Makeup was overlaying the before and after, for Directing we got outtakes from each film which included the clapper board, Original Screenplay had key pieces of handwritten text to echo those first notes a writer will make, and Production Design collected all the props together to really show the viewer how much thought goes into a strangely invisible part of the job. Sounds familiar! The Production Design category was a clear favourite for many: Tell us about the concept and how you collected all those little bits and bobs for each film. That was a risk. Jenn was instrumental in pushing for a design first approach. I came to her with a request to do this design and I said, “Trust me, it'll be great, but there is a massive risk." You send out for props, you pay for a shoot for a day, and you divert resources on a weekend to a category that the show’s producer might not like... It could all have been for nothing. It’s a testament to the trust and design understanding that Elastic has in supporting the vision. Without that we would have played it safe, tried to photoshop the boards and they wouldn't have looked as good or as real. 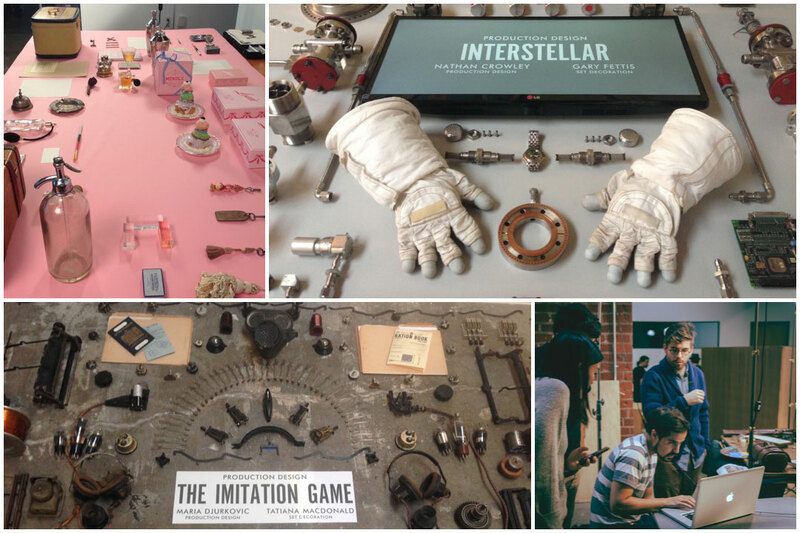 The props were a combination of real elements from the films with carefully curated replicas or near matches. The Grand Budapest people sent through a host of cool pieces, including Mendl’s boxes, books and ephemera that had everyone cooing in the office. Do you have a favourite category? I think in many ways the fact that each category looks different is what makes it all stand out. The package being so varied makes it strong. But if I had to choose, it would be Production Design, closely followed by Makeup (that Paul Kim led), and Best Picture. I'm also very proud of the actor cards with the bold typographic approach. I should mention the Animated Feature one which Leanne illustrated, it very nearly didn't make it. We wanted to keep red, black and white as the Oscars 2015 colour palette and pay homage to the styles and illustrations with a unique Saul Bass graphic approach, simplifying the original animations into shapes and abstract forms. When we finished and presented we had a long discussion on whether or not this enhanced or took away from the craft. Luckily the producers agreed that it was a homage to the art, and the simplicity and uniform look kept it visually striking. Are there any little details you’re proud of that people don’t seem to have noticed? 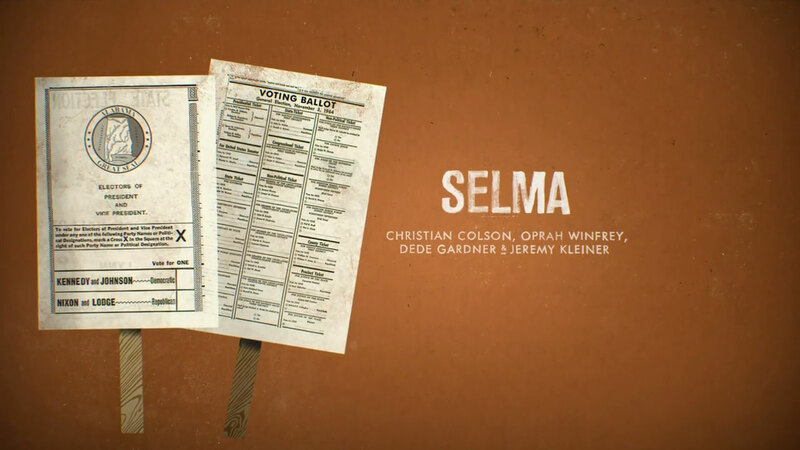 Small things are scattered throughout, in the Best Picture category there is type that relates to my home town in England, The Theory of Everything is a nod to a job I did that brought me to the States with Why Not Associates, and the Selma voting slip happens to have Lodge – a nod to the show's producer. There are tonnes of small elements in the production design that haven't been noticed too. Even with a tight turn around getting those easter eggs in is a fun part. We have a lot of interesting pieces that were not used, like the dust in Interstellar. We covered the table in a stop frame style with dust, that got cut, some early animation tests for that too are nice examples of how even with the large workload we tried a variety of approaches constantly evolving the animation. 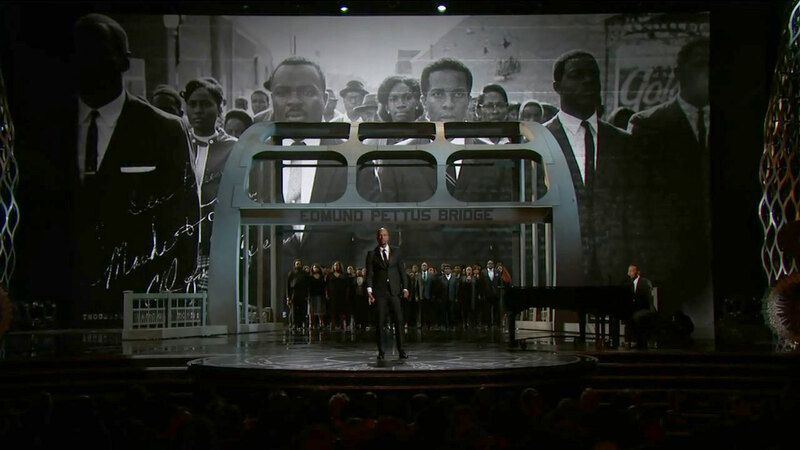 Tell us about the process of integrating motion design/montage with the live performances, particularly with respect to John Legend and Common’s stunning rendition of “Glory” from Selma. Lee Lodge gave clear direction that Selma should use materials from the era: Make something that plays as homage and also treads carefully around a powerful subject. So I started pulling rough looks together and with Krystal Sojourner the sequence came to life. 45 frames later – we eventually reduced it to 9 – the most powerful and evocative emotional images were chosen. As Ryan pulled the edit together it was amazing as the music synced up and the hairs on the back of your neck stood up. What's it like working with The Academy of Motion Picture Arts and Sciences as a client? How involved were the producers of the show? Neil Meron and Craig Zadan were the show’s producers and without them there would be no large creative vision. Lee Lodge, as producer too, his understanding of design allows for risks to be taken from my end and throughout the whole project. The proof of the process is in the results. The fact that in a primetime award show we have a series of completely different and elegantly designed title sequences is testament to the fact that Neil, Craig and Lee visualize the bigger picture and are open to innovation. Some 3D (Cinema 4D and Maya), After Effects, a lot of After Effects. Photoshop, InDesign and a lot of paint, pen and ink. Many are calling the motion graphics from this year’s awards one of the real highlights of the show. What’s the response been like for you and the team? The response has been great. We played a small part in a huge machine, and I'm sure even without the graphics the show would look as stellar. Our aim was to communicate the huge process of filmmaking, to translate every role within the process to a wider audience, and if we can add some design elegance then we have succeeded. To have recognition for the motion graphics is amazing though, but you can see a similar level of thought and love put into the other shows too, like the VMAs, also done by Elastic. Will you be handling the Oscars design duties next year? If so, what direction do you want to take? You’ve set a high bar! You never know. If we’re lucky enough to be involved again the aim would be to take this even further. The Visual Effects category nearly had a different look, which I was excited about but time killed us on that, so maybe next year. Those little ideas will percolate. 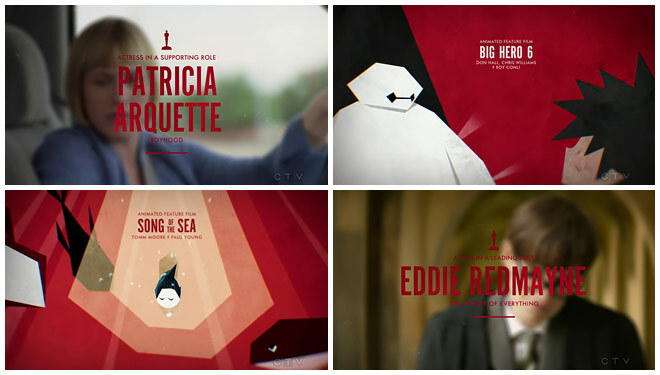 What are you thoughts on a potential Best Title Design category at the Oscars? Do you feel you’ve helped make the case this year? It’s a difficult one. I would obviously love to see it recognized, but I would also like to see casting directors or stunts mentioned. 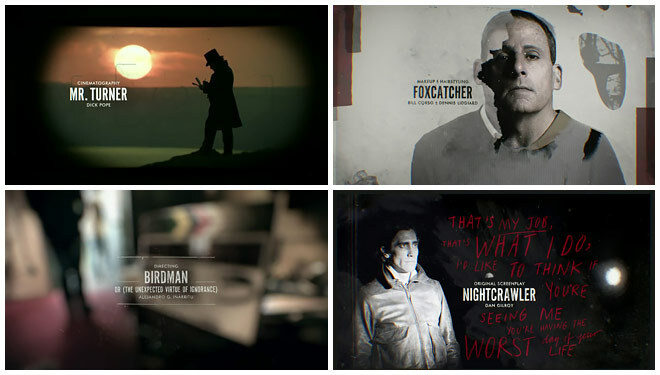 I’m just happy that we have found a way to get title sequences into the Oscars, even if they don't get awarded. What are some of your personal favorite title sequences, either classic or contemporary? Still obsessed with Enter the Void? Yep, can you imagine getting Enter the Void as a category sequence design next year? For Adapted Screenplay perhaps? It would be amazing. Never going to happen. Seriously though, last year The Lego Movie and True Detective stood out. For me being able to split my life between design and filmmaking is an honour, so my ADD mind is sated by being able to jump between the two worlds. Having Maggie coming out in May is keeping me excitedly nervous. One last question: Do you have anything you'd like to say to noted design and award show critic Donald Trump? Not everything should be dripping in gold. Looking at his ridiculous hair it’s clear he has no idea what looks good or not.